Jan 9: The body of a person in an immersion suit, was recovered from the water in the area of the burning and drifting SANCHI , and as of Jan 9, the body still was not identified as a SANCHI crew member, or some other person. 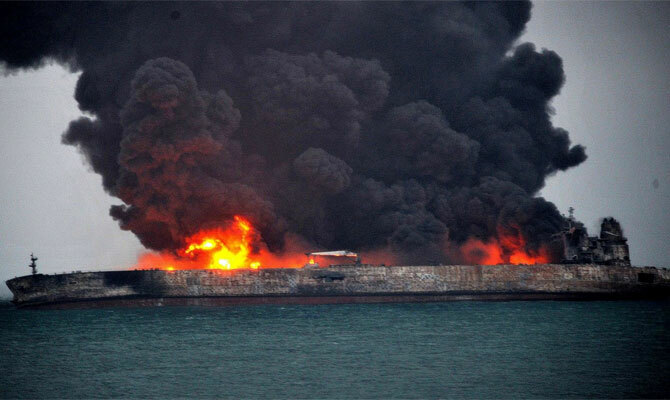 Judging from all available information, salvors couldn’t yet board the tanker, it’s too dangerous. There are talks, with reference to Chinese officials, of possible massive explosion and tanker sinking, but that may be considered as hardly possible. The light oil condensate which SANCHI was carrying is described as being highly inflammable and explosive, in comparison with other types of crude oil. There are pics and video of bulk carrier CF CRYSTAL, at the moment SAR ship was pouring water on her forecastle, and later, showing the damages she sustained. Her forecastle is severely damaged, there is no doubt, that CF CRYSTAL struck SANCHI , and that SANCHI was the one to give the way to avoid collision. It looks like CF CRYSTAL hit SANCHI and went on with her bow along tanker’s hull, ripping tanks and igniting oil or oil fumes with showers of sparks, originated by forceful contact of ships’ steel hulls. That’s my best guess on what happened and how, explaining fire all along cargo deck and burned out forecastle and superstructure. The crew or part of crew should be still on board, sheltering somewhere deep down, and hopefully, alive, waiting for help.